Make your first song one that will really pump you up for your workout. This can really help you kick off your workout and give you the energy to get started. A great first song can put you in the right mood for the gym. Try to have a large pool of songs to listen too. This can keep your playlist interesting. 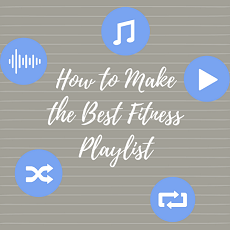 A blend of different genres and artists can keep your engaged and entertained throughout your workout. Choose to listen to songs that match the tempo of your workout. This means including songs for the warm-up, high-intensity, and cool-down aspects of your workout. This can help motivate you and keep you going in a great rhythm. Having your music and workout in sync can be very helpful and energizing. Pick songs that really speak to you. Songs that remind you of good times can help distract you from the difficulty of your workout. Also, knowing the lyrics can also give you something to focus on. Singing along in your head can help you keep your pace. Having a fitness playlist (check this link for song ideas and more!) is a simple tool that can help improve your workout. Music is a great motivator when you need that extra burst of energy. Your playlist can be specific to you, and reflect how you feel and what you want to accomplish. When you get tired of your playlist try mixing it up with new songs. Remember that your playlist can be continuously changing just like you.